Thanks for taking the time to play it. The memories! I really liked these type of games when I was a kid. 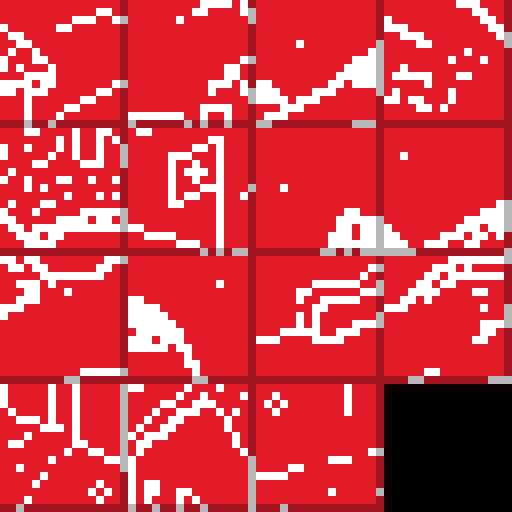 And the twist of not knowing how the finished puzzle looks like adds a hidden aesthetic to the game. It's no longer just trying to figuring out where should everything goes, but also it adds a memory component, because the game lets me know when a square it's in his right position, but since I still need to move it, I need to try to remember each of these positions. PS: It's also nice to see other entries made by Godot. It's refreshing not seeing Unity games. Not that there is something inherently wrong with the engine, but I found awesome to see devs picking up other development tools. I made my first game with Godot in 2015 and so far I am still very happy with the engine. 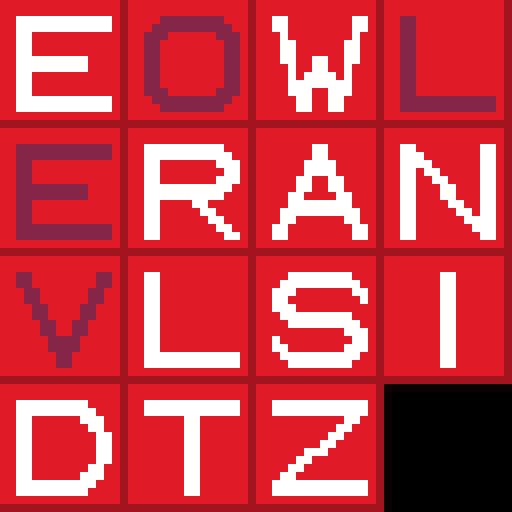 Neat puzzle game entry, well done! I enjoy these games and it lived up to expectations. Nice theme and music too. Maybe an option to see what the finished image should look like, though I don't know where I would that icon, maybe with low opacity in one of the corners? I was thinking of implementing a cheat mode. This gives you the possibility to switch to the final image while puzzling. Impeccably implemented sliding 15 puzzle. Cool music, too. 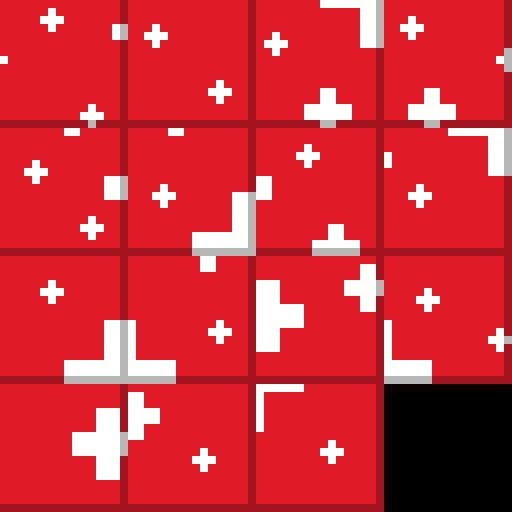 I am ashamed to admit that I didn’t get very far because I’m not very good at 15 puzzles, especially when the image is as abstract as this, but that’s not the game’s fault (and you even give a little sound and flash when a piece is in the right place, so there’s no excuse). Well done. Also great to see Godot being used; as someone who’d like to experiment with Godot I’d be an eager reader of a really detailed devlog explaining how this was built, how it was restricted to 64px, how you made it expand to a larger size on the page, and so on! I started to write a little dev log. Should be ready in the next few days. Creating a 64x64px game in Godot is not difficult. Thanks for taking the time to play the game. I look forward to reading that! Thank you! What a useful resource. I've been watching some Godot tutorials, and seeing how a real programmer does this stuff is really handy. Difficult one to rate for me, I'm absolutely awful at 15 puzzle even at the best of times, and with these, I have very little concept of what the solutions are actually going to look like - I doubt I'd be that good at finishing them even if I could just swap tiles from anywhere jigsaw puzzle-style. A very choice few people would almost certainly appreciate the sentiment of the game though, and it appeared to be well-executed and well-built. It was intended from the beginning not to show the final result. 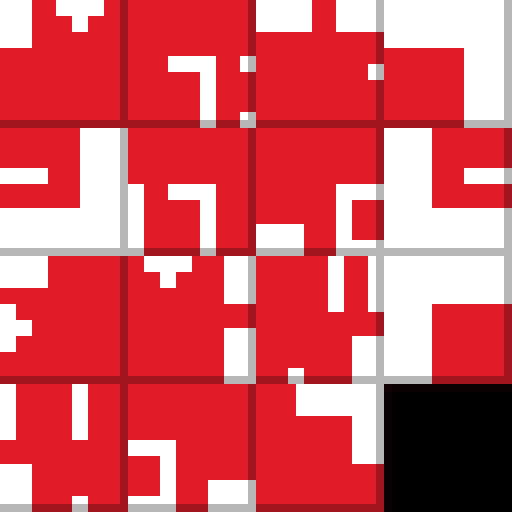 The player should find out where they are placed together with the visual feedback and the tile transitions. I have to confess that it makes the 15 puzzle a lot harder to solve. Thanks for taking the time to play it anyway. If you want to learn it I can recommend this page. It explains it in great detail and step by step.